I have a super quick project for today – I’ve been up to my eyeballs in graduation party prep (yikes, how long have I ignored this house?? ), CHA prep, college orientation, and fun stuff like that. But anyway, here is my card, more photos are on the Crafty Power Blog on the Scrapbook Adhesives by 3L™ website. 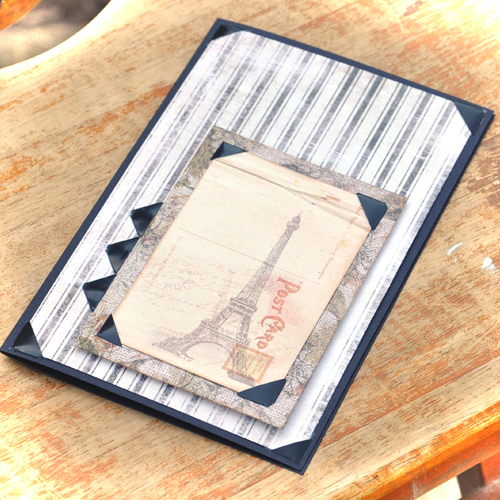 This entry was posted in Card, SCRAPBOOK ADHESIVES BY 3L and tagged Card, Eiffel Tower, Glitz Design, photo corners, WorldWin Papers. Bookmark the permalink. I think your card is beautiful. I love your use of the photo corners. Very cool!